In a Nutshell: While on-the-job training was once standard across many industries, the majority of the most in-demand skills are now being hired — not trained. Additionally, an increasing number of workers are choosing to do it themselves, becoming freelancers and entrepreneurs. To obtain the skills necessary to reach new career goals, including the business and financial know-how to (successfully) work for themselves, millions of people are turning to Coursera.org. 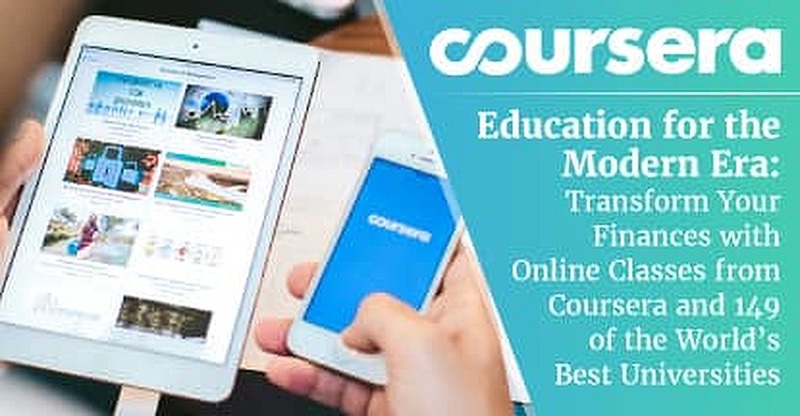 A leading provider of online education materials, Coursera partners with 149 of the world’s leading institutions and professors to provide over 2,000 complete courses across more than 160 specialties. From basic business skills to advanced accounting, anyone can improve their financial know-how with the resources at Coursera. Widely attributed to English philosopher-scientist Sir Francis Bacon, the Latin aphorism “scientia potentia est” — which translates to “knowledge is power” — rings as true in modern times as it did in Bacon’s 16th-century world. If anything, as the digital era advances at a fevered pitch, the value of knowledge is only increasing. It’s also quickly expanding well beyond the proficiency gained from a traditional college education. That’s not to say college is becoming less valuable; there is little dispute that a well-chosen college degree has many benefits. In fact, repeated studies have shown that, on average, those with degrees earn more money than those without. However, the demand for more specialized skills, coupled with the wealth of non-traditional educational resources becoming available, such as online learning, has led to many employers to shift emphasis from potential employees’ educational pedigrees, and more on the skills they bring to the table. To meet the demands of changing technology, employers and employees alike are forced to evolve skills and approaches to business. For a growing number of workers, that evolution includes switching careers, or, for some — striking out on their own. Dubbed the “freelancer economy,” the burgeoning population of the self-employed includes more than just creators and developers hustling gigs. The modern business world is chock-full of eager, technologically inclined entrepreneurs raring to make an impact. What the new generation has in digital skills, however, it often lacks in business and financial know-how. Of those looking to expand and upgrade their skills, whether to change companies or to start one of their own, more than 24 million have relied on Coursera.org. An education technology company started by a pair of college professors in 2012, Coursera provides over 2,000 online educational courses, covering 160 specializations from accounting and business, to physics and computer science. With its multitude of offerings, anyone with internet access can improve their financial know-how (and just about any other type of know-how) on Coursera. Change is scary. Changing companies or careers is not just scary — it can also be expensive. New jobs generally need new skills, and the fact is that education does not come cheap. To paraphrase a popular saying: if you give a man a fish, you can charge $5; if you teach a man to fish, you can charge $5,000. In contrast, by partnering with 149 of the world’s top universities, Coursera digitally — and affordably — connects some of the most respected professors in their fields with learners from across the globe. The cost of learning a new skill through Coursera ranges from $29 to $99 a month — less than or equal to the cost of a single class session at a state college (and a small fraction of the cost at a pricier school, like Yale or the University of Pennsylvania, both Coursera contributors). Coursera users can choose from more than 2,000 courses offered by many of the world’s top colleges. Living somewhere between the traditional venues of classroom learning and on-the-job training, Coursera users can advance current job skills or develop brand new ones. Of those students who used Coursera to further their career, 87% found success, with 33% receiving tangible benefits such as a new job or promotion. Students can work at their own pace, on their own schedule — and from wherever they are. Courses include a variety of materials, including video lectures, reading materials, and graded assignments. Upon passing a course, students receive electronic certification badges that can be used to share their accomplishments with potential employers on a résumé of via LinkedIn. With courses ranging from beginning accounting to financial engineering, anyone can improve their financial know-how with Coursera. Single courses provide bite-size learning opportunities, with most courses designed to be completed in just four to six weeks. For a more comprehensive experience, Coursera users can work toward a multi-course specialization in their chosen subject, learning a new skill in just months. Coursera even offers students the opportunity to earn a fully accredited degree in data science or business administration through a program with the University of Illinois. And everything is designed with the modern online user in mind. When changing careers, starting a business, or, really, just living life, strong financial skills are an absolute necessity. At Coursera, those important financial skills can be learned from some of the world’s brightest minds in accounting, business, and economics, and prestigious schools such as Yale and Columbia. Indeed, Coursera users are learning far more than simple personal finance skills (though Coursera has those, too); the top seven most popular finance courses over the last four years span a range of beginning to advanced finance topics. Taught by Robert Shiller, the Sterling Professor of Economics at Yale University, the Financial Markets course is an eight-week adventure into a range of market-related topics, including risk management, debt versus equity, regulation, and infrastructure. To complete the course in eight weeks as designed, students should expect to put in 6 to 12 hours a week on the lectures, reading, and graded assignments. For those uninterested in receiving a certification or having access to the graded materials, the Financial Markets course can be accessed for free by Coursera members. Another course available for free to those who don’t need a certification, the eight-week Financial Engineering and Risk Management Part I course is an advanced finance course heavy with technical jargon taught by Columbia University’s Martin Haugh, Co-Director, Center for Financial Engineering, and Garud Iyengar Professor Industrial Engineering. This five-week course from James Weston, Houston Endowment Professor of Finance at Rice University, can be audited for free with limited access (no graded materials). As a global platform, it should be little surprise that one of Coursera’s most popular finance courses is in another language. Conducted in Spanish, Finanzas Personales is taught by Norman Wolf del Valle, Facultad de Contaduría y Administración from the Universidad Nacional Autónoma de México. The three-week course includes the limited free option and describes itself as giving people the tools to make good personal finance decisions. Unlike some of the other courses, Introduction to Corporate Finance doesn’t offer an audit option. After a seven-day free trial, the course will cost $79 a month. A five-week, multidisciplinary look at the foundations of managerial economics, Managing Your Money is taught by Dr. Peter Navarro from the University of California, Irvine, and can be audited for free. Created by the University of Pennsylvania, Accounting Analytics is taught by accounting professors Brian J. Bushee and Christopher D. Ittner. Once upon a time, a person’s career was set by his or her education; a degree in education meant a career in, yes, education — one that usually consisted of joining a single company, for life. Today, however, with technology forcing many industries to evolve or face extinction, the workforce is having to evolve, as well. Whether changing companies, or starting their own, millions of workers are going online to find the new skills they need to face the digital era — just as the 24 million people who have used the resources from Coursera.